The Facilitator’s Kit research and technical background, a fully scripted seminar, handouts, and a PowerPoint presentation, making it easy to deliver a comprehensive training experience right out of the box. All-new, research-validated online assessment with 26-page management-specific stand-alone report helps managers to understand themselves, their employees, and their boss. A Handbook on the Science of Training. 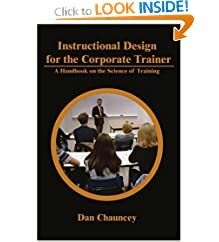 This handbook on the science of training will take corporate trainers to the next level of their profession. A Guide for Your Journey to Best-practice Processes. 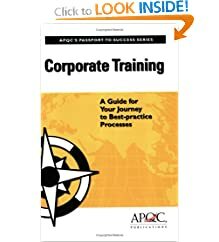 Corporate Training: A Guide for Your Journey to Best-practice Processes will help both organizations just establishing a formal training function and those looking to energize existing operations. Designing, Managing, and Growing a Successful Program. Here is a wealth of information on this major development in professional education. Provides hundreds of creative training tips applying research on how the brain accesses, processes, analyzes, stores and retrieves information. Ideas and instructions on how to increase energy and active participation in the classroom. A Business Approach to Training and Development. Translates the popular Six Sigma methodologies, tools, and techniques in a way that is customized specifically for the design, implementation, and measurement of employee development programs.